Olympic break for Red Wings? No way! Being on your country's national team is the highest honor for a European hockey players such as Pavel Datsyuk and Henrik Zetterberg. Seven out of the 10 Detroit Red Wings players scheduled to participate in the 2014 Winter Olympic Games have been injured this season. Except for Tomas Tatar and Tomas Jurco, both representing Slovakia, and Niklas Kronwall (Sweden), every other Red Wings Olympian — Team Sweden’s Henrik Zetterberg, Daniel Alfredsson, Jonathan Ericsson, Johan Franzen and Jonas Gustavsson; Team Russia’s Pavel Datsyuk; and Team USA’s Jimmy Howard — has missed significant playing time this season. Detroit’s roster has been a revolving door, with a steady stream of players making their way to the infirmary, at an alarming rate. 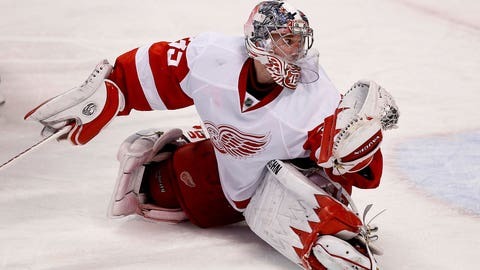 It’s been such an epidemic that the Red Wings’ consecutive playoff streak of 22 seasons is at risk. So I’m not surprised that many fans and a few pundits have asked me in a whispering tone, "Should the Wings allow their hurt guys to play in the Olympics?" As valid as that question is — and as much as a three-week break could help on the road to a full recovery — it will never happen. Except for Howard, the Wings’ Olympic contingent are all Europeans, and being on your country’s national team is the highest honor for a European hockey player. Competing in the Olympics, the World Championship and the World Junior Championship rank right there with playing for the Stanley Cup. North American hockey players aren’t less patriotic than their European counterparts, but their ultimate prize is the Stanley Cup. That’s not the case for European hockey players. Over the years, each and every European Red Wings player has told me that the NHL was in the back of his mind while growing up, but playing for his country was the primary goal. And even if the NHL came calling, it didn’t diminish his desire to represent his home country. Unless an individual player decides that it’s in his best interest to forego the Olympics, expect to see — if healthy — 10 Red Wings in Sochi from Feb. 13-23. Although nationalism is the main incentive for a player, the Red Wings could do more harm than good if they approached any of their players about staying home from Sochi. Realistically, how can Red Wings GM Ken Holland or head coach Mike Babcock ask any of their players not to participate? After all, Holland, as a special consultant, and Babcock, as the head coach, helped pick Team Canada, which is one of the favorites to win Olympic gold. It would be hypocritical for Holland and Babcock to ask their Red Wings Olympians to stay home. If they did so, they might even be accused of attempting to give Team Canada a competitive advantage. Like it or not, everybody from the Red Wings scheduled to go to the Olympics likely will go.